Description - Our Premium Flat Top Dance Tiles are constructed from a single molded piece and are durable from top to bottom. Ideal for practice in the home or for use in studios, the flat surface is great for any shoe type and for a number of dance styles. Choose one solid color for a large, bright surface or make your own design using several color options. Material - Constructed of the best high quality impact resistant polypropylene (extremely durable hard thermoplastic polymer) available. 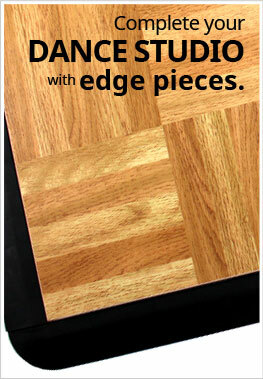 Recommended Uses - Premium Flat Top Dance Tiles can be used as a hard flooring practice dance surface for a variety of dance styles, including tap, ballroom, flamenco, jazz, and hip hop. Great for ballet, tap, and jazz. Use with or without Marley. Easy to disassemble for multiple installations. Install over our rubber underlayment for added comfort. I bought these for my 8 year old to have a practice space in our house at any time of day. It's great for the in between times at the studio. Thanks!